From the Snowden revelations we learned not only about NSA data collection projects, but also about many software tools that are used to analyze and search those data. These programs run on secure computer networks, isolated from the public internet. 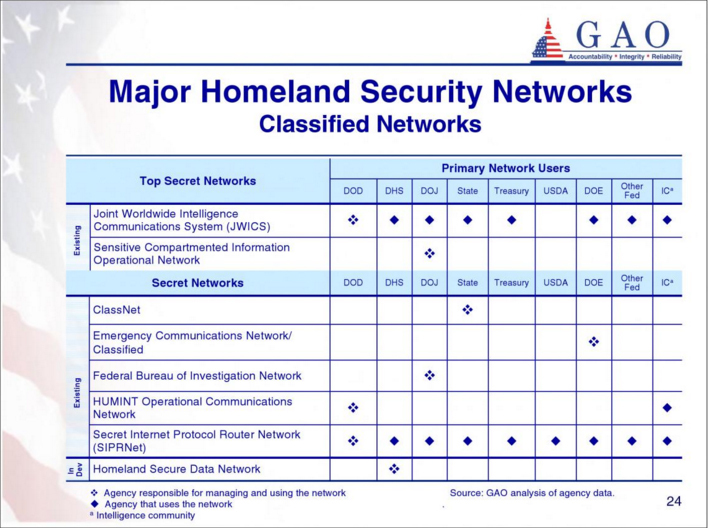 Here we will provide an overview of these networks that are used by the US military and US intelligence agencies. Besides computer networks, they also use a number of dedicated telephone networks, but gradually these are transferred from traditional circuit-switched networks to Voice over IP (VoIP). This makes it possible to have only one IP packet-switched network for both computer and phone services. 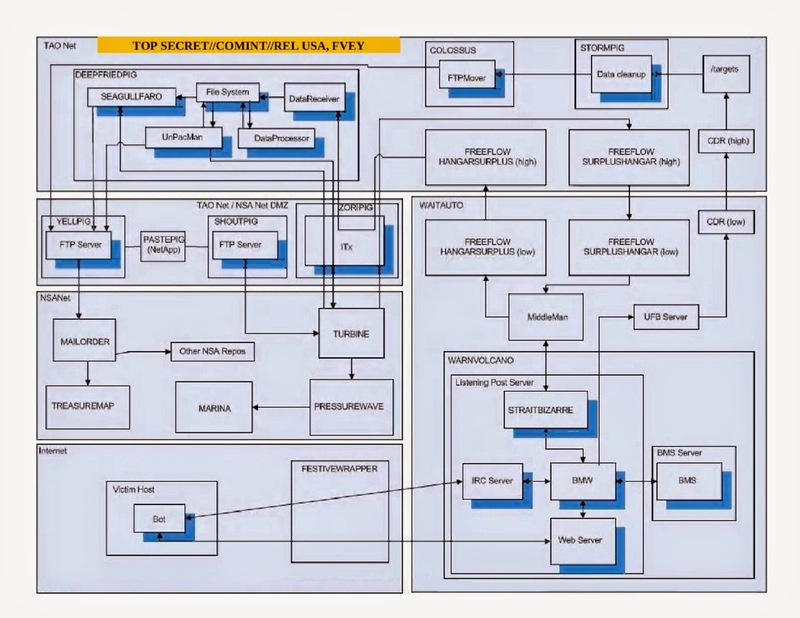 It seems that for example NSA's NSTS phone system is now fully IP-based. The main US military and intelligence computer networks are (of course) only accessible for authorized personnel from the United States. Special security measures are in place to prevent interception by foreign intelligence agencies. Most of the tools and programs used by NSA run on JWICS and NSANet, but here we only mention them when this is confirmed by documents. - Computer applications: Intelink-U, Intellipedia, EViTAP, etc. - Purpose: Combat support applications for the US Department of Defense (DoD), Joint Chiefs of Staff (JCS), Military Departments (MILDEPS), Combatant Commands (COCOM), and senior leadership; composed of the unclassified networks of the DoD; provides protected access to the public internet. 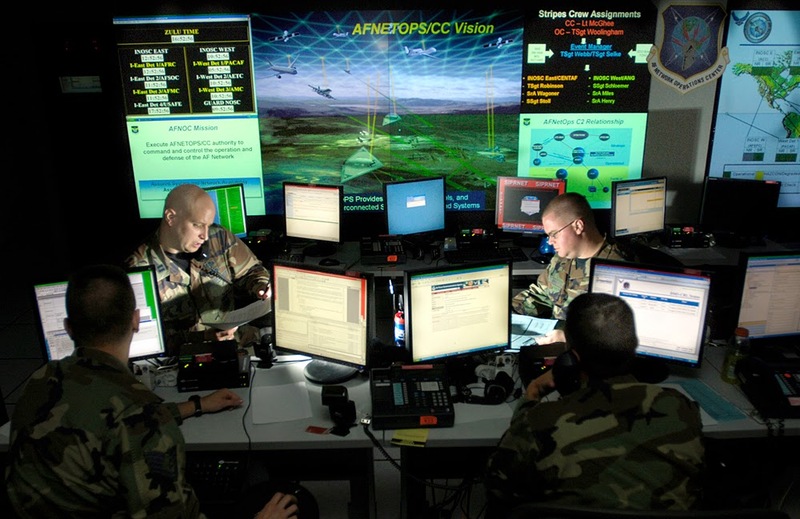 - Purpose: Supporting the Global Command and Control System (GCCS), the Defense Message System (DMS), collaborative planning and numerous other classified warfighter applications, and as such DoD's largest interoperable command and control data network. - Computer applications: Intelink-S, Intellipedia, TREASUREMAP, Joint Deployable Intelligence Support System (JDISS), Defense Knowledge Online, Army Knowledge Online, InfoWorkSpace (IWS), etc. - Phone service: VoSIP (Voice over Secure IP) as an adjunct to the DRSN for users that do not require the full command and control and conferencing capabilities. 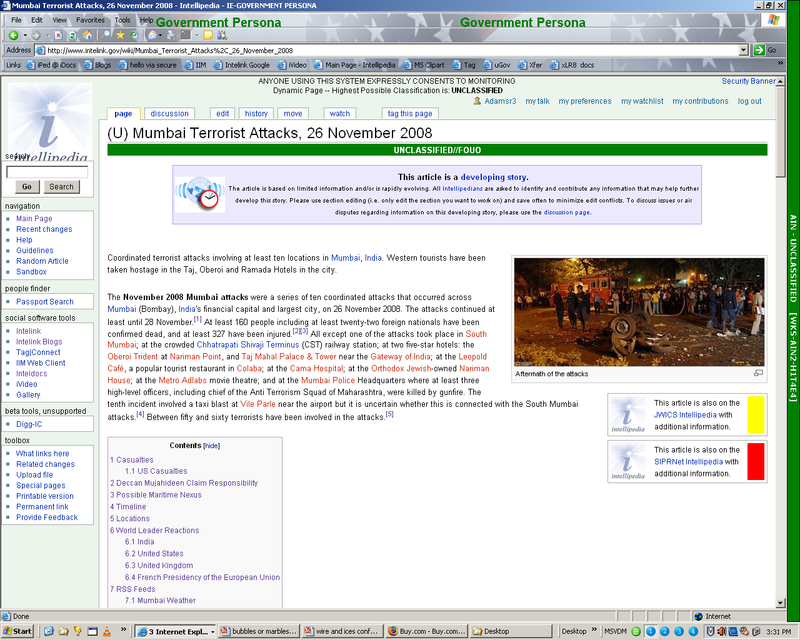 - Computer applications: ICE-mail, Intelink-TS, Intellipedia, GHOSTMACHINE, ROYALNET, TREASUREMAP, ICREACH, Joint Deployable Intelligence Support System (JDISS), etc. These various military and intelligence networks run on a world-wide physical infrastructure that is called the Defense Information Systems Network (DISN), which is maintained by the Defense Information Systems Agency (DISA) and consists of landline, mobile, radio and satellite communication links. Most of these communication links are not connected to the public internet, but because radio and satellite transmissions can easily be intercepted by foreign countries, the security of these networks is assured by encryption. This encryption can also be used to run higher classified traffic over communication links with a lower classification level through Virtual Private Network (VPN) tunnels. As long there's the appropriate strong link encryption, only the end points with the computer terminals (where data are processed before they are encrypted) need strict physical and digital security requirements in order to prevent any kind of eavesdropping or interception by foreign adversaries. 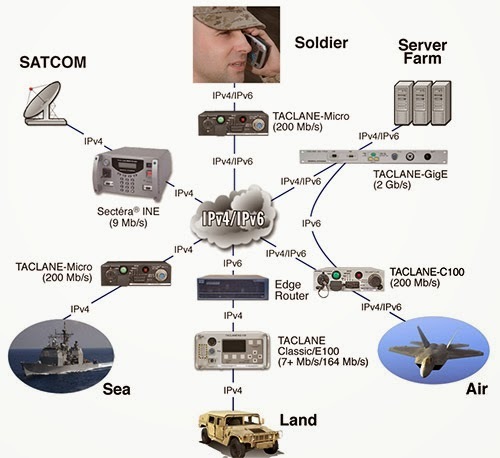 Most American military bases are connected to the SIPRNET backbone, but for tactical users in the field, the SIPRNet and JWICS networks can extend to mobile sites through Satellite Communications (SATCOM) links, like for example TROJAN SPIRIT and TROJAN SPIRIT LITE, which consist of a satellite terminal that can be on a pallet, in a shelter, on a trailer or even connected to a transit case. Finally, there's the Capitol Network (CapNet, formerly known as Intelink-P), which provides Congressional intelligence consumers with connectivity to Intelink-TS and CIASource, the latter being the CIA's primary dissemination vehicle for both finished and unfinished intelligence reports. Besides the aforementioned networks that are only accessible for authorized military and intelligence personnel from the United States, there are also computer networks set up by the US for multinational coalitions, and which therefore can also be used by officials from partner countries. The group of countries that have access to such coalition networks is often denoted by a number of "Eyes" corresponding with the number of countries that participate. - Computer applications: InfoWorkSpace (IWS), SIDToday (newsletter), TREASUREMAP, MAILORDER, MARINA, TURBINE, PRESSUREWAVE, INTERQUAKE, CATAPULT, Cellular Information Service (WCIS), GATC Opportunity Volume Analytic, etc. - Purpose: Supporting research, development and testing on command, control, communication, computer, intelligence, surveillance and reconnaissance (C4ISR) systems. 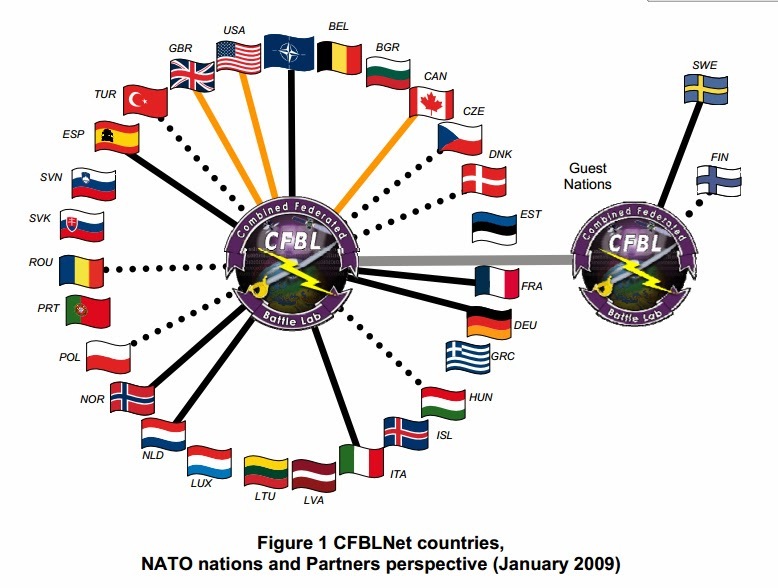 six NATO guest nations (dotted line) and two non-NATO countries. 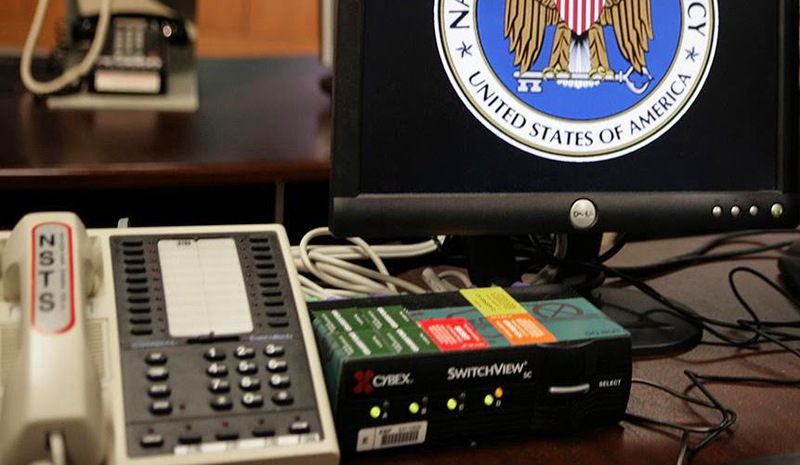 For communications among the members of multinational coalitions, the United States provides computer networks called Combined Enterprise Regional Information eXchange System (CENTRIXS). These are secure wide area network (WAN) architectures which are established according to the specific demands of a particular coalition exercise or operation. CENTRIXS enables the secure sharing of intelligence and operational information at the level of "SECRET REL TO [country/coalition designator]" and also provides selected centralized services, like Active Directory/DNS Roots, VoIP telephony, Windows Server Update Services (WSUS) and Anti-Virus Definitions. - Purpose: Sharing critical battlefield information; US component of the Afghan Mission Network (AMN). - Computer applications: Web services, instant messaging, Common Operational Picture (COP), etc. 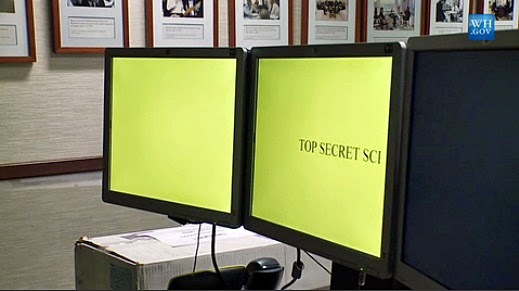 - Classification level: TOP SECRET ? - Computer applications: E-mail, Chat messaging, Webpages, etc. PK: Wow! Thanks for this. This is new information for me. It provides information review on how some corporations can use multiple encryption units. Best regards. Oh those bring back memories! 10 years in the Intel world and I used most of those, minus some of the NSA networks. There are times I miss it, others not so much lol. Where does the secure Bullrun community of interest fit into this? Such a Community of Interest (CoI) is a segregated part or an enclave on a given network, in this case probably on NSANet or TAONet. I miss looking at secret information. The NSA put a virus into my eyes. This is an amazing article. Thanks for sharing this information. I find this article very interesting.